I received two recent books from Zondervan in the mail this week. Both are valuable tools for studying the Greek New Testament. Constantine R. Campbell, Keep Your Greek: Strategies for Busy People, 90 pages, $9.95. This little book is an answer to the most common question a Greek teacher is asked: “What should I do to keep up on my Greek after seminary?” As sad as it is to admit, even the best students of Greek in college or seminary find it nearly impossible to improve their Greek once they are in ministry. While most pastors want to use Greek in sermon preparation, the realities of a busy Pastor’s life prevent careful exegesis of the Greek New Testament, most are forced to rely on commentaries and inter-linear Bibles. For the most part, Campbell’s strategy for keeping one’s Greek sharp is to read the Greek New Testament every day, slowly and without the use of the typical crutches on which pastors rely too heavily. This is the same sort of advice I give, and probably every teacher of Greek gives. But Campbell points out that it is important to set a reachable goal, 15 minutes a day, or perhaps even as little as a verse a day. This is excellent advice, since most who set out to sharpen their Greek try to do more than they are capable of, and end up failing. As far as crutches, Campbell recommends you “burn your Interlinear.” All Greek teachers will agree here, although we might ask why you bought it in the first place! Similar advice applies to computer aids, since it is so very easy to read Greek when Logos or Accordance is glossing and parsing every word for you as you scroll. To improve your Greek, computer tools have to be used judiciously. The book is written in a very light style with good illustrations and stories to make the point. Occasionally quite funny, the advice in the book ought to inspire a pastor toward re-viving their Greek skills. At a mere $10 retail, there is no reason not to buy this little book. Much of the material in this book originated on Campbell’s blog, Read Better, Preach Better. In fact, each chapter ends with a comment section drawn from the original discussion on the blog. A Senior Lecturer at Moore Theological College in Sydney, Australia, Campbell is the author of Basics of Verbal Aspect in Biblical Greek (Zondervan, 2008). Based on the samples on his website, he is a pretty good Jazz saxophonist. 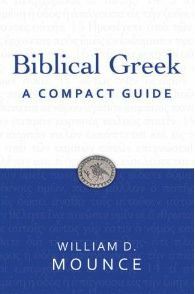 William D. Mounce, Biblical Greek: A Compact Guide, 212 pages, $19.95. This little volume is a handy summary of Mounce’s Basics of Biblical Greek (BBG). It contains a basic summary of most major grammatical issues and a nice section containing paradigms and noun charts. He includes principle parts for verbs occurring 50 or more times in the Greek New Testament as well as a mini-lexicon (glossary) for words appearing 50 or more times. Of course all of this is available in his regular BBG, but Zondervan has published this material in a handy format (4.2 x 6.5 inches) with a heavy-duty plastic cover. I passed the book around my second year Greek students and most thought this little book would be a great help to their reading of the New Testament. I would recommend this book for anyone who is trying to keep up with their Greek using Campbell’s book. If there is any drawback, it is the retail price of $19.95, since all of the material appears in Mounce’s Basic Grammar. My guess is that the reinforced binding and plastic cover added to the cost of the book. The handy size and usefulness of the contents make this a good addition to the busy pastor’s library.